The lodge says Nortje put his hand through a fence despite warning signs everywhere. 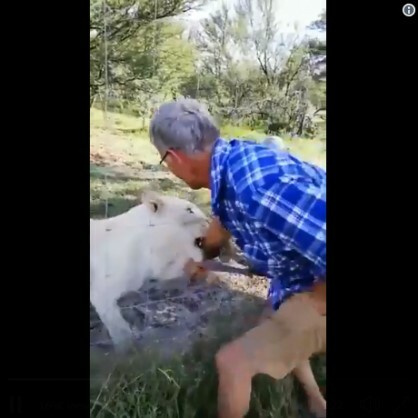 Social media went into a frenzy on Wednesday following a video showing a man being mauled by a lioness after putting his arm through an electric fence of their enclosure at the Tikwe River Lodge in the Free State on Saturday. Pieter Nortje, a mechanic from SA Truck Bodies in Bloemfontein, had been at the lodge celebrating his wedding anniversary with his wife, Ilze, when they were given a guided tour through two lion enclosures. Thinus Sadler from Virginia in the Free State told Netwerk24 that the lodge had been giving guided tours for six years and that Nortje’s incident was the first. In the video, Nortje can be seen petting a lion, while calling another for a massage, when things get dangerous. As he tries to pet the lioness, his arm goes straight to her mouth and she starts biting. However, things go south when Nortje screams “Eina!”, while his wife also shouts: “Hy byt hom! Hy byt hom [He’s biting him, he’s biting him! ], Come let’s get out of here!” as he tries to remove his arm from the lioness’ mouth. He was immediately rushed to hospital.